Since multi-party democracy was introduced in Somaliland in 2002, elections have successfully ushered in peaceful transfers of power. But questions have been raised about election financing. This study argues that in Somaliland, as elsewhere, elections should be understood not just as political processes, but also as economic events in which parties, and candidates and their supporters make investments with no guarantee of return. 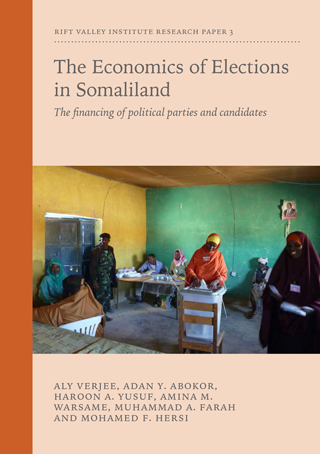 The Economics of Elections in Somaliland examines candidates’ expenditure and sources of income in the 2005 parliamentary and 2012 local council elections. To compete, candidates need to commit significant funds, often resorting to loans to fund their campaigns. The elections have given rise to a new language of electoral politics and new professions, such as vote broker. The study concludes that conceiving of elections solely as exercises in democratic representation ignores a broader social and economic reality. The lack of a regulatory system for campaign finances may compromise future electoral processes in Somaliland, and diminish both national and international confidence in them. Aly Verjee is a Senior Researcher with the Rift Valley Institute who has observed more than 20 elections, including the 2005, 2010 and 2012 polls in Somaliland. Adan Abokor organized international election observation missions in several Somaliland elections and was a member of the Electoral Monitoring Board of Somaliland from 2003 to 2012. Haroon Yusuf is the Programme Coordinator for the Nagaad network, which focuses on women’s rights, democratization and governance in Somaliland. Amina Warsame was one of the first women in Somaliland to run for election in 2005 for a seat in Somaliland’s Parliament. She is a former chair of Nagaad, and is founder of the Somaliland Women’s Research and Action Group (SOWRAG). Muhammad Farah is a Senior Researcher and an Undergraduate Tutor at the University of Burco. Mohamed Hersi is the Director of the Academy for Peace and Development (APD) in Hargeysa.